Posted on June 22, 2018 at 3:55 pm. 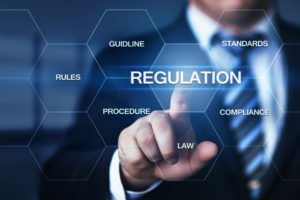 Managing the requirements and following the guidelines when it comes to regulatory compliance labeling can be a challenge. Especially for organizations in the chemical, medical, and food & beverage industries. It’s become a higher priority for companies with adherence to strict and evolving policies that have placed additional demands for compliance labeling. Chemicals: Global harmonized System (GHS) of classifying and labeling chemicals mandates that pictograms, hazard statements, signal words and more must appear on all chemical products. Importing/exporting of these chemicals can add even more complexity. Pharmecuticals: The FDAs Drug Supply Chain Security Act (DSCSA) directs manufacturers to comply with serialized product labeling to ensure full traceability from production to patient. Drug makers who market their products in Europe will have to comply with European Medicine Agency (EMA) regulations. Medical Devices: US Food and Drug Administration (FDA) stated in 2013 that all medical devices must be registered and have a Unique Device Identifier (UDI). This plan was part of a 7 year- roll out, but companies are still grappling the changes. In addition they must comply with The EU’s Medical Device Regulations (MDR) which was introduced in 2017 and is a compliance requirement similar in comparison to UDI, but has their own stipulations. Food and Beverage: The FDAs Food Safety Modernization Act (FSMA) goal was to provide the consumer with full transparency in the production products from origination to distribution. Additionally there are new requirements for labeling nutrition facts.